TechCrunch Disrupt Audience Choice winner Badgeville announces a $2.5 million Series A round today in order to apply its badge-based game mechanics across the web. Investors in the round include eBay COO Maynard Webb, Palantir founder Joe Lonsdale, Pejman Nozad and Zain Khan from Felix Investments and senior executives from Paypal, Chegg, Shopping.com, Drugstore.com and Warner Music. 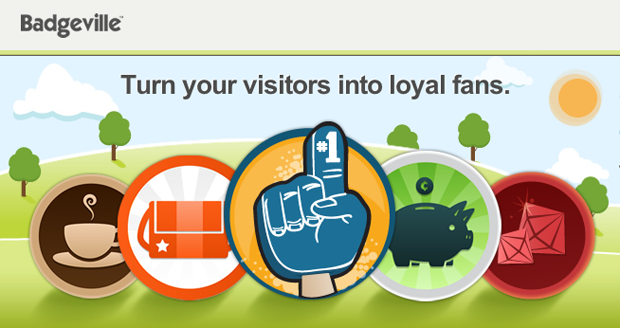 Publishers who use Badgeville can set up an account, offer defined rewards and track visitor behavior with realtime analytics. Badgeville works for any company that has a community on its site: Anyone from gaming to education, to retail and more can use the service to reward people for checking into a site, taking tests or simply browsing through products. Virtually anything can correspond to a badge reward. Since their launch at TechCrunch Disrupt, the startup has had over 1500 companies inquire for information and has signed up dozens of partners including Comcast Sports, Philly.com, The Next Web, Blackbook and us. Founders Kris Duggan and Wedge Martin expect over $1 million dollars in bookings in 2010 (within their first four months of launching) and ascribe the influx of interest in Badgeville to the current hybird trend of “social + gaming + loyalty + analytics for the web,” a space shared by OneTrueFan and Big Door. The startup plans on using the financing to increase staffing, further product engineering and supporting its large scale clients. Duggan tells me they plan on expanding their Palo Alto offices from 10 employees to 20-30 in the next 12 months and are, like everybody else, hiring.